The first-term Republican senator has been peppered with such questions because his summer travel schedule reads like an itinerary for a potential presidential candidate: Iowa, New Hampshire, South Carolina and Florida - four early-voting states in the primary and caucus calendar - are all on the list. In the interview that aired Sunday, Karl pressed further on whether Cruz is ready to run for president. “You know, I'm not focused on the politics,” Cruz replied. “Is it fair to say you're not?” Karl asked. “I've been in the Senate all of seven months. The last office I was elected to was student council. So this has been a bit of a whirlwind,” Cruz said. “The senator is willing and excited go anywhere where people want to listen to his vision and message for restoring our nation's economic growth,” she said. And Cruz told reporters Friday in Iowa that he considers the visits an opportunity to "engage grassroots activists." He added that it was "premature" to decide who they should support in 2016, but he said he'll support "whoever is standing up and leading." Cruz’s eligibility for president, however, has come into question, given that he was born in Canada to a father from Cuba and a mother born in the United States. Cruz addressed the question in the ABC interview. “My mother was born in Wilmington, Delaware. She is a U.S. citizen. So I am a U.S. citizen by birth,” he said. 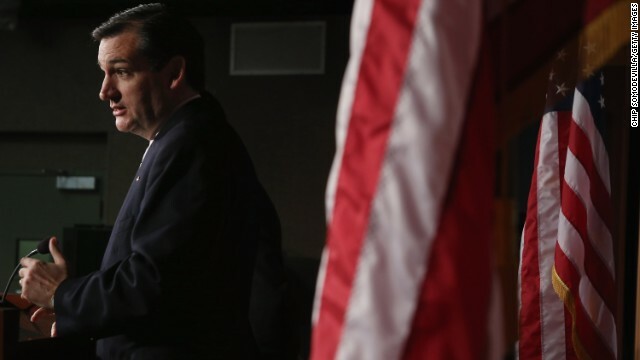 "My focus right now is not on politics," Cruz said. That's OK, Ted, I can settle this question for you. Since you don't have a snowball's chance in Hell of being elected President, save your money and take your ultra-right extremism on a long, long vacation. Just say he hasn't ruled it out; but has plenty to do before then.